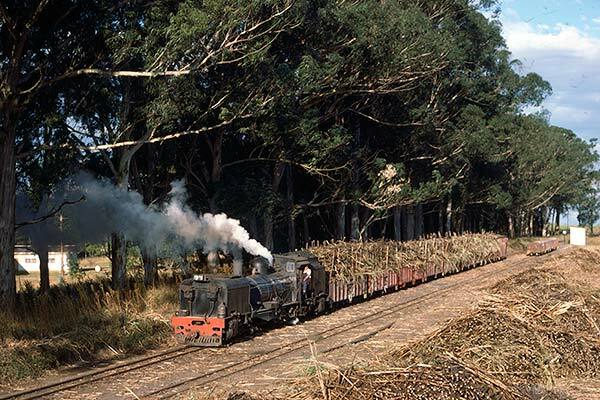 Caption - South African Railways (SAR) NGG13 class Garratt no.60 shunts loaded wagons of sugar cane at Killarney. The train is on the 27 mile two foot gauge branch from Umlaas Road, with a connection to the Durban main line, up into beautiful countryside to terminate at Mid Illovo. This line was an early casualty with closure in 1986. At the time of this visit in June 1976 there were just two locos used on the line, no.60, seen in the picture, and no.59 which was dead at Umlaas Road loco shed.